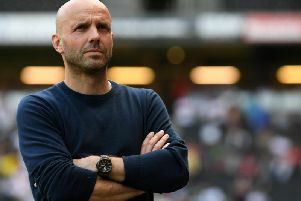 MK Dons' undefeated start to the League 2 season may have come to an end at Lincoln City, but manager Paul Tisdale said it was a significant step forwards in his side's performance. Jason Shackell's 94th minute header consigned Dons to their first defeat in League 2, after Shay McCarten cancelled out Rhys Healey's 64th minute opener. After a poor showing against Forest Green Rovers a week earlier, it was a significantly more positive performance from Tisdale's side, but ultimately saw them come undone late in the day. "It's a gut-wrencher. It feels absolutely horrid," said Tisdale. "We went toe-to-toe with them, they had the territory in the first half – they're a good side. But we developed our style in the second half, became more positive and I thought we had as good a chance in the last 10 minutes to win it. "We've certainly not disappointed with our defensive performances generally, but our goals conceded recently have been from set pieces. "The substitutions changed the style a bit and we deserved the goal as a result of that positive move. We went for the win – it wasn't a case of sitting back. Although it feels horrid, it was a step forward in so many ways. We've got to pick ourselves up and hit the ground running on Tuesday." With 10 minutes to go and Lincoln turning the screw, Tisdale urged his side to go for the win rather than hold on. He continued: "I wasn't thinking about holding on for a draw. The whole time they were attacking, I was looking at the really positive front line we had at the end. "There is progress, but ultimately you walk away from the ground, look at the league table and see it as a disappointing day but I know, deep down, we've made progress."